Elizabeth Brickell’s practice is rooted in a tactile sensibility. She harbors objects that are imbued with memory and connection to a place or occasion. 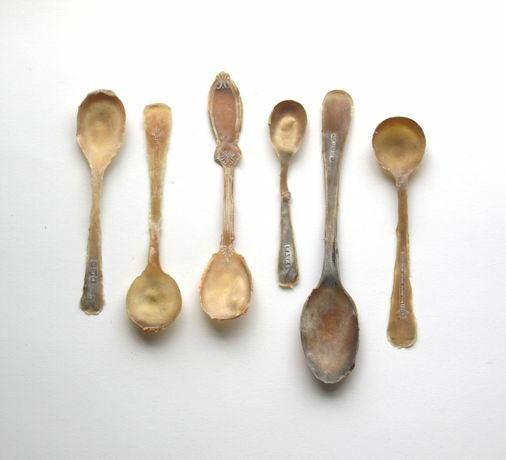 A collection of spoons, of varying size and dimension, is contained in the space: each spoon clearly pronouncing its individuality and heightened by its recreation in thin latex. These delicate ‘skins’ explore notions of fragility and reference the act of ‘moving on’. While being a reinvention they leave behind a skin of ‘what was’. In the broader sense, the work aims to address human vulnerability.